We've got you covered for your Principles of Management course with Schermerhorn/Bachrach, Management 13th Edition Binder Ready Version. With new cases, more opportunities for self-assessment and the Management Weekly Updates news blog, the text and its comprehensive suite of resources promote critical thinking and active learning. 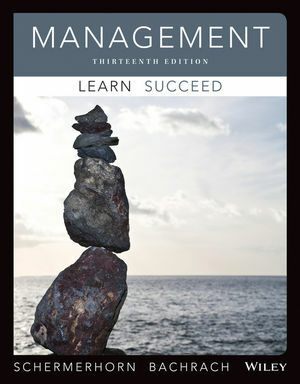 Thoroughly updated while maintaining its trusted balance of concepts and applications, Management 13th Edition Binder Ready Version presents the most current material to apply theory and show relevance of management concepts in the real world–for students to succeed in your management course and beyond. This text is an unbound, binder-ready version. Dr. John R. Schermerhorn, Jr., is the Charles G. O'Bleness Professor of Management in the College of Business at Ohio University, and formerly served as Director of the Ohio University for Southeast Asian Studies. He earned a Ph.D. in organizational behavior from Northwestern University, and an M.B.A. (with distinction) in management and international business from New York University. Dr. Schermerhorn previously taught at Tulane University, The University of Vermont, and Southern Illinois University at Carbondale, where he served as Head of the Department of Management and Associate Dean of the College of Business Administration. New Co-author: Joining the 13th Edition, Dr. Daniel G. Bachrach, Associate Professor of Management at the University of Alabama contributed his research and teaching expertise to several chapters in Part 5: Leading, as well as numerous other features throughout the text. Timely content – All chapters have been updated, with new examples and expanded coverage of topics like social responsibility, sustainability, ethics in global management, new venture funding, data mining and analytics, downsides of goals, employment issues and controversies, followership and leadership, emotion and mood contagion, and team virtuousness. Student Engagement – Each feature is designed to attract student attention and engage them in reflection and critical thinking. These include Analysis – Make Data your Friend, Ethics – Know Right from Wrong, Insight – Learn About Yourself, and Wisdom – Learn from Role Models. Critical Thinking and Active Learning: Features throughout each chapter, like Ethics on the Line, Facts for Analysis, and Management Cases for Critical Thinking engage students in timely examples, and applications of chapter material. Integrated Learning Model: With frequent summaries and check-in points, the Integrated Learning Model helps students stay on track, review material and prepare for tests and quizzes. Self-Reflection: A variety of opportunities for self-reflection exist in the text, especially with Learning About Yourself, the Management Skills and Competencies, Further Reflection Questions, Self-Assessments, Team Exercises and Career Situations. Career Situations: These mini-cases encourage students to apply chapter content to common early-career scenarios. WileyPLUS Learning Space: WileyPLUS Learning Space is an easy way for students to learn, collaborate, and grow. With WileyPLUS Learning Space, students create a personalized study plan, assess progress along the way, and make deeper connections as they interact with the course material and each other.